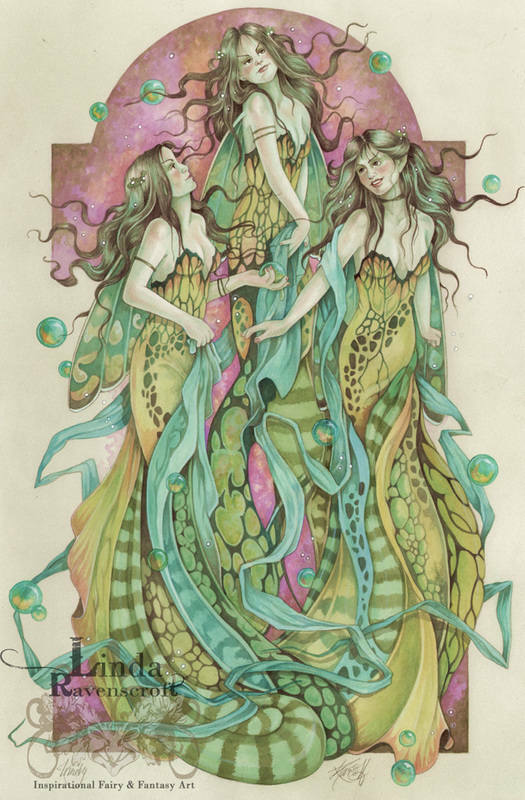 A rare opportunity to acquire an incredible original Linda Ravenscroft painting “Trinity" Three sisters of emerald green. ............. BY THE AMAZING ARTIST LINDA RAVENSCROFT..........! 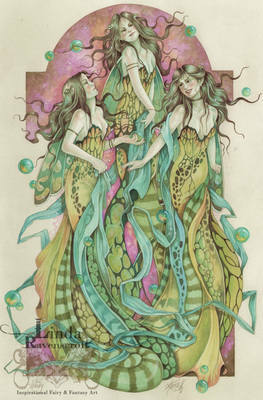 Trinity, three sisters of emerald green, united together in their joy and freedom. Watercolour and graphite on Arches watercolour paper.
" An Amazing Blue Chip Investment Opportunity to Acquire an Original Linda Ravenscroft Painting" ..
Linda became a professional artist in 1994 after the birth of her daughter Vivien (aka Ivy), who was very ill after her birth, so Linda was unable to go back to her office job as she had planned, the only other thing she thought she could do to earn a living whilst taking care of her daughter was “Paint”. Since then she has featured in many Fantasy/Fairy Art books, such as “The Art of Faerie” “The World of Faerie” and “Watercolour Fairies” she has also illustrated and written several Tutorial Faerie Art books, including the best selling “How to Draw and Paint Fairies” “How to Draw and paint Fairyland” The “Mystic Faerie” Tarot Deck, by Llewellyn Publishing, her own “Enchanted” Faerie and Fantasy Art of Linda Ravenscroft and “The Fairy Artists Figure Drawing Bible”, also her best selling “Woodland Faeries Calendars” together with TV appearances promoting herbeautiful Card crafting C.D. ROMs and rubber stamps and other craft materials on the Ideal World Create and Craft, shopping channel here in the UK. Linda’s work is collected worldwide, in Europe and the USA in particular. Her images can be found as counted cross stitch patterns by Heaven and Earth designs, wonderful figurines, calendars, cards, ceramics and giftware collections from Nemesis Now, greeting cards with Eastgate resources are just a few of the wonderful things Linda has available to collectors.Linda has been fortunate enough to be invited to many wonderful faerie events and gatherings all over the world, where she has met many loyal collectors and fellow artists who have become wonderful friends over the years, Linda hopes to continue to create her art, to share and inspire more people all over the world. .
“My inspiration comes from many sources.I rely mostly on my dreams and inner feelings as I have done since I was a child together with my love of nature, and fascination for myths and ancient legends my mind is constantly visualising NEW creations.In my view “Faerie” represents the natural world we live in, and whether you believe or not, they do have a place in our modern day society, in fact their light is needed more now than it ever was before.It's time to look at this world and our feelings towards our fellow man, and realise what harm we are doing. Most of my images are inspirational and uplifting, offering hope or a thought for the future of this beautiful world we live in.I truly believe that we all have a little bit of Faerie light within our hearts, helping us to make the right decisions in our everyday lives we just have to look for it, and let it SHINE BRIGHTLY in the darkness”!